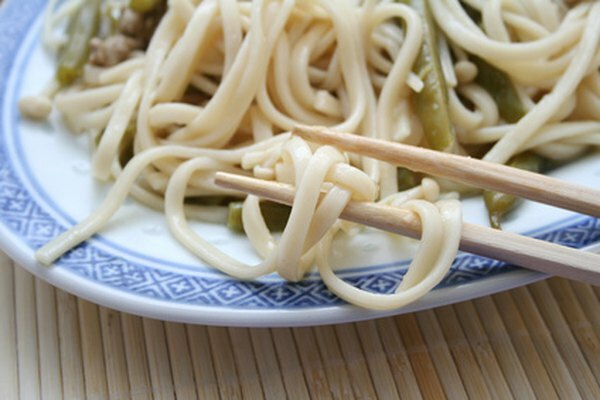 Udon noodles -- a type of buckwheat noodle -- make up an important part of Japanese cuisine. They were first introduced to the Japanese culture by a Buddhist priest named Kukai in the 9th century A.D., according to the Asian Food Grocer website. Udon noodles are usually eaten with broth or chilled. Udon noodles don't offer a nutritional goldmine -- they don't serve as a significant source of vitamins or minerals -- but, consumed in moderation, they can fit into a balanced diet plan. Food serving sizes listed on nutrition facts labels are standardized to help you compare similar food products. For example, both udon noodles and spaghetti pasta have a serving size of 2 ounces. It is important to pay attention to a food item's serving size because it determines the calories and nutrients. A 2-ounce serving of dry udon noodles contain 200 calories. Udon noodles are very low in fat. One serving contains 1 grams of total fat and 0 g of saturated fat. The USDA dietary guidelines recommend you limit your fat intake to 20 to 35 percent of your total calorie intake and your total saturated fat intake to less than 10 percent of your total calories. On a 2,000-calorie diet that means 44 to 78 g of total fat a day and less than 22 g of saturated fat a day. The primary ingredient of the udon noodle is wheat, making it a high carbohydrate food. Each 2-ounce serving of udon noodles contains 40 grams of carbohydrates and 1 gram of fiber. About 45 to 65 percent of your daily calorie needs come from carbohydrates. Carbohydrates provide your body with energy. Udon noodles are not a significant source of fiber, though, so you'll miss out on fiber's stomach-filling and cholesterol-lowering benefits. Each serving of udon noodles contains just 4 percent of the recommended daily fiber intake for women. A 2-ounce serving of dry udon noodles contains 7 grams of protein. As a plant-based source of protein, udon noodles do not provide all of the essential amino acids. But if you eat a balanced diet that includes vegetables and whole grains, you will adequately meet all of your amino acid needs. Most Americans get more than enough protein in their diets, according to the Centers for Disease Control and Prevention. Adult women need 46 grams of protein a day, and adult men need 56 grams of protein daily.